RT7302 and RT7304 are constant current LED drivers with active power factor correction (PFC). They support high power factor across a wide range of line voltages, and drive the converter in the quasi-resonant (QR) mode to achieve higher efficiency. By using primary side regulation (PSR), RT7302/RT7304 control the output current accurately without the need of a shunt regulator or opto-coupler at the secondary side, reducing the external component count, the cost, and the size of the driver board. This application note presents a step by step design guideline for an isolated single stage constant current LED driver with PFC using the RT7302. The guideline can also be applied to RT7304. The design example in this application note describes an 18W LED driver with slim form-factor, suitable for T8 LED tube applications, but the same design can also be used in LED bulb or other form factor applications. RT7302 and RT7304 are constant current LED drivers with active power factor correction (PFC). They support high power factor across a wide range of line voltages, and drive the converter in the quasi-resonant (QR) mode to achieve higher efficiency. By using primary side regulation (PSR), RT7302/RT7304 control the output current accurately without a shunt regulator or opto-coupler at the secondary side, reducing the external component count, the cost, and the size of the LED driver board. RT7304 embeds comprehensive protection functions for robust designs, including LED open circuit protection, LED short circuit protection, output diode short circuit protection, VDD under voltage lockout (UVLO), VDD over-voltage protection (VDD OVP), over-temperature protection (OTP), and cycle-by-cycle current limitation. RT7304 is available in a cost effective SOT-23-6 package. RT7302 has the same basic functionality as RT7304, but integrates more features, including fast startup via high voltage pin, PWM dimming, and input voltage feed-forward compensation. RT7302 is available with SOP-8 package. 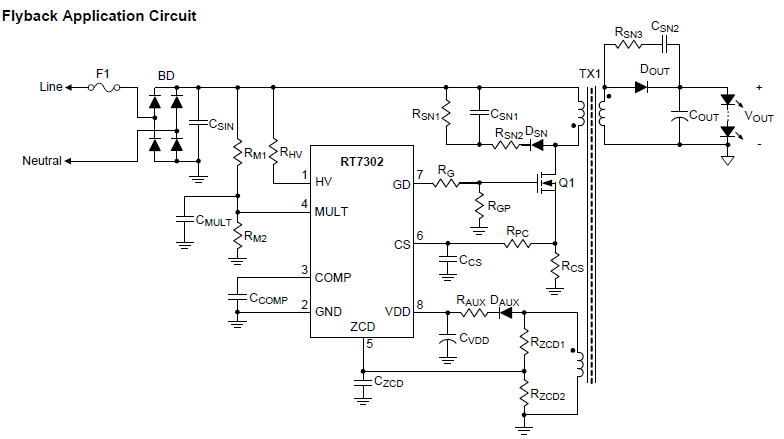 This application note presents a step by step design guideline for an isolated single stage constant current LED driver with PFC using the RT7302. The design guideline can also be applied to RT7304. 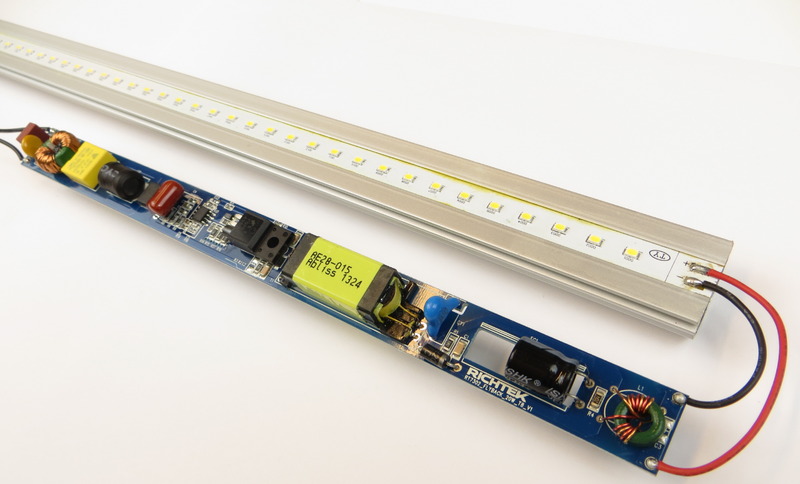 The design example in this application note is an 18W LED driver with slim form-factor, suitable for T8 LED tube applications. Figure 2 shows RT7302 in a typical flyback converter topology with input voltage (Vin). When the converter operates in critical-conduction mode (CRM) with constant on-time control, the envelope of the peak inductor current will follow the input voltage waveform in-phase. Thus, high power factor can be achieved. The minimum on time is set by the upper divider resistor of the ZCD network RZCD1. Quasi resonant switching is achieved by sensing the auxiliary winding zero current condition and a smart internal valley detection circuit. Switch-on of the MOSFET will always happen at a valley of the resonant voltage, thereby reducing switching losses and EMI. The ZCD pin is also used to sense output OVP condition, set by RZCD2. The primary peak current is sensed by measuring the voltage across the MOSFET source resistor via the CS pin. 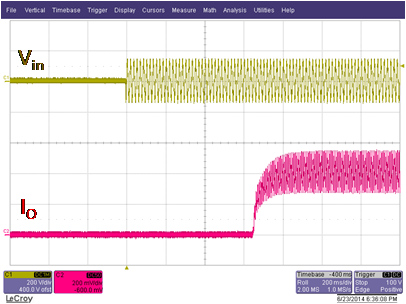 An internal leading edge blanking circuit removes any spikes from this signal. A current variation due to a propagation delay is compensated by the CS pin internal current source and the external series resistor RPC. The MULT pin is used for sensing the input peak voltage, and controls the ramp for T-on generation. The line voltage sense is used as feed-forward to adjust the ramp for constant COMP voltage over line voltage. This improves the regulation, eases compensation and achieves accurate maximum power limit over the full mains range. This is especially important for full range LED driver designs. RT7302 HV pin will quickly charge the capacitor connected to the VDD pin during start-up. After start-up, the HV pin is disconnected, and the VDD is supplied by the auxiliary winding. This method ensures fast start-up without extra power dissipation in the bleeder resistor during normal operation. The RT7302 design tool can be used to quickly determine the component values. Chapter 3 contains a detailed step by step design description for the 18W reference design. 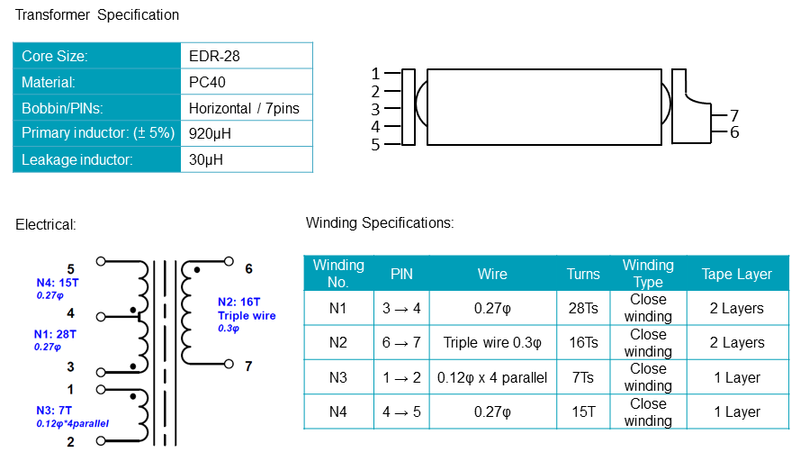 The LED driver example for this section is the 18W T8 LED driver evaluation board, see Figure 3. Figure 3. The board measures 230x18x10mm and will fit in most narrow tube T8 housing behind the LED board. where η is the estimated efficiency. The efficiency is estimated at 85%, the input power will become : 47*0.4/0.85 = 22.12W. where ISEC_pk is the peak current of secondary side, IPRI_pk is the peak current of the primary side, NS is the turn’s number of the secondary winding, and NP is the turn’s number of the primary winding. CTRTX1 can be estimated to be 0.9.
where Vf is the forward voltage of output diode. Vro is recommended to be within 95 ~125V. In the example: Set Vro = 125V. where VTH_OFF is the falling under voltage lockout (UVLO) threshold voltage of the controller. VDD supply voltage at max. output voltage VDD_max must be within VDD_Vomax_min ~ VDD_OVP_min. The output capacitor value will determine the amount of voltage ripple on the LED string. This voltage ripple, together with the dynamic resistance of the LED string will determine the current ripple through the LED string and this will cause 100Hz or 120Hz light flicker. 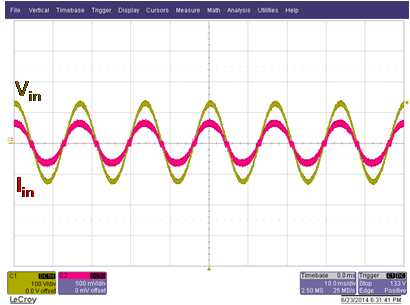 where IOUT_PP is 2x the average LED current, and VOUT_PP is the allowed AC output voltage ripple and f is double line frequency. 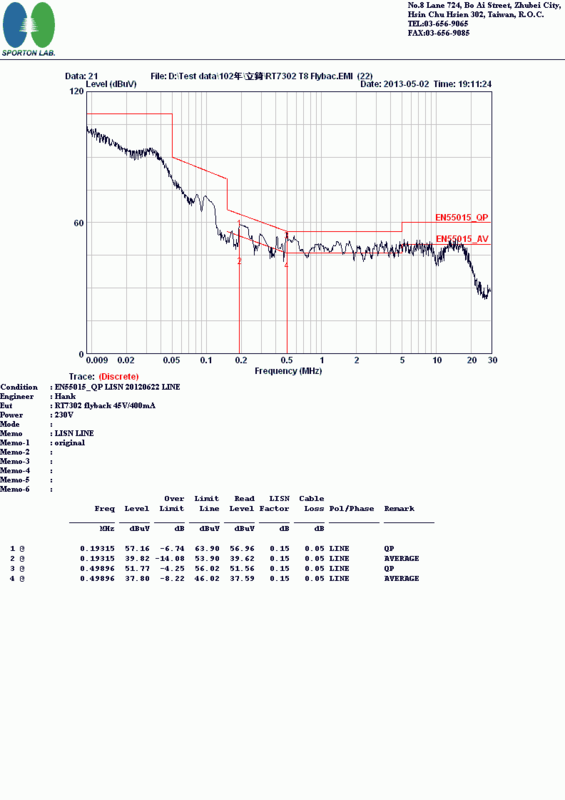 Calculating for 50Hz line frequency: COUT = 2*0.4/(4.76*2*π*100) = 267µF. For less LED current ripple, the COUT value needs to be increased. But when LED strings with higher dynamic resistance are used, the COUT value can be reduced. in which fs_min is the minimum switching frequency. Thus, Lm can be obtained after the minimum switching frequency fs_min is determined. where Ae is the cross-sectional area of the core in m2, and Bmax is the maximum flux density in Gauss. IP_pk = 1.23A, Lm = 899μH, EDR-28 core is chosen and its Ae = 88m2. Set Bmax = 2950 Gauss. Obtain NP_min > 42.5 turns. Now all the parameters of transformer are determined, including NP_min, NP/NS, NS/NA and Lm. NP = 43T, NS = 43/2.62 = 16.4T, choose 16T, NA = 16/2.35 = 6.8T, choose 7T. where KCC is a reference in the controller. The current sense resistor RCS will become (1/2)*2.69*(0.25/0.4)*0.9 = 0.79 Ω. A 600V / 1A diode bridge will provide sufficient de-rating, including inrush current and voltage surge. in which Vclamp is the maximum voltage on the snubber and it must be higher than Vro. 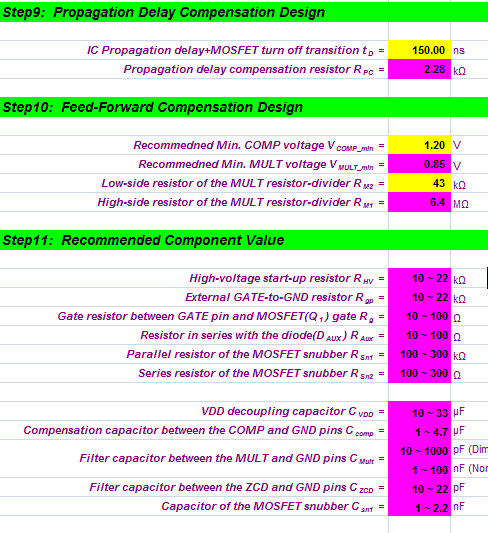 VDS_max = 373+160 = 533V : for sufficient de-rating, choose at least 650V rated MOSFET. 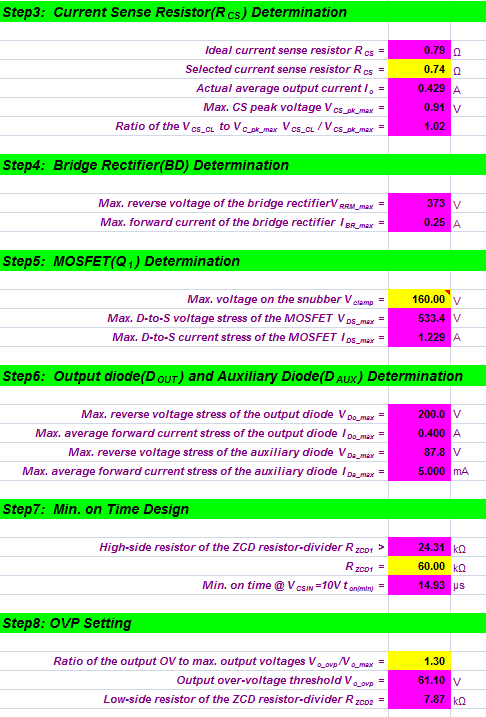 IDS_max = IP_pk = 1.23A : MOSFET Rdson selection depends on thermal aspects. In this small T8 design, a 4A MOSFET with Rdson of 1.8Ω was selected, which can be used without heat-sink. where VO_OVP is the output over voltage level. Diodes with higher current rating can be chosen for higher efficiency. 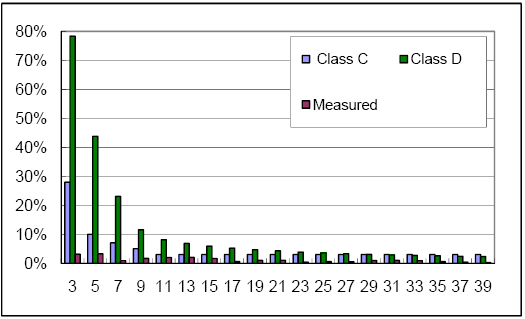 where VDD_OVP is the VDD over voltage level. in which IDD_max is the maximum supply current for the controller. In general, longer ton_min can slightly improve THDi. However, if ton_min is too long, it will induce a current resonance at Vin zero crossing, worsening THDi. Thus, ton_min can be properly defined according to the measured THDi. 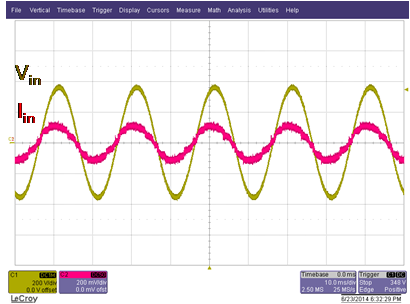 The delay period td is varied with the parasitic capacitance of MOSFET, the gate driving capability, and the propagation delay of the controller. Thus, td cannot be estimated accurately, and RPC may need to be modified according to the measured output current. If the output current increases when Vin rises, RPC should be increased. If the output current decreases with Vin rises, RPC should be decreased. The COMP voltage, VCOMP, can be derived from the following equations. VMULT_pk is the peak voltage on the MULT pin. 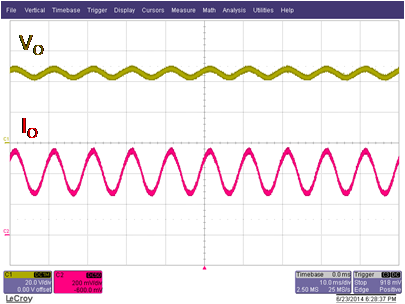 Gmramp is the trans-conductance of the ramp generator, and its typical value is 2.5μA/V. Cramp is the capacitance of the ramp generator, and its typical value is 6.5pF. When the converter operates at CRM, (ton + toff) / tS=1. VCOMP_min is recommended be within 1.2 ~ 1.5V, and RM2 is recommended to be within 30 ~ 60kΩ. Thus, the voltage divider resistors RM1 and RM2 can be determined according to the above parameters. It can be calculated that RM1 = 6.4MΩ. 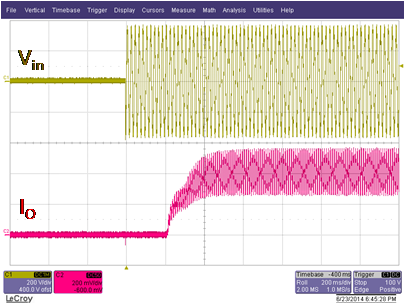 The RT7302 design tool and RT7304 design tool can be used as quick way to determine the component values. The content is similar to the step by step design as described in Chapter 3. In the design tool, users input operation parameters into "Yellow Grid". According to the key-in parameter, the design tool will automatically generate the results in Pink Grid". 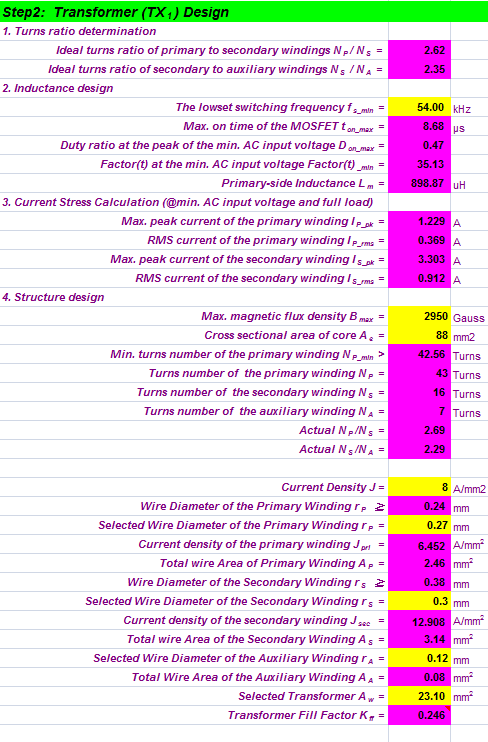 Table 1 below shows the entered data and calculation results for the 18W T8 reference design. The circuit diagram of the evaluation board is shown in Figure 4 below. RV1 is added for line surge protection. 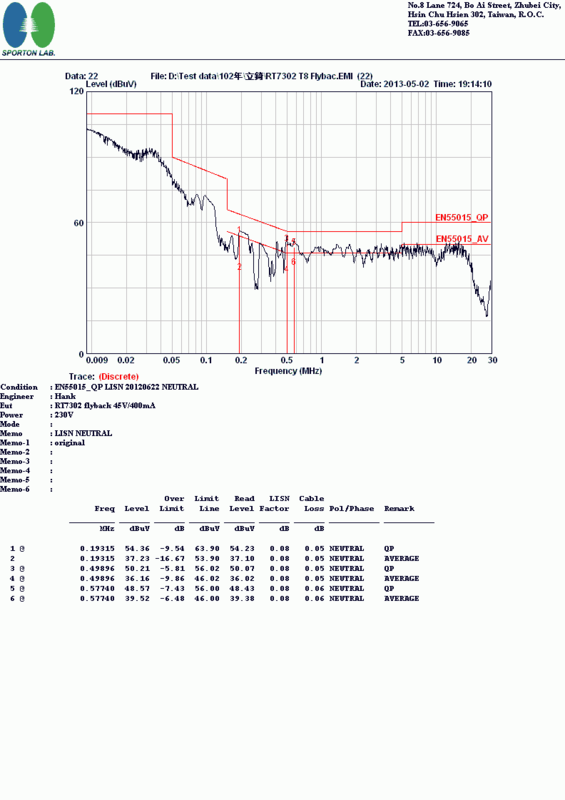 LX2, CX1 and LX1 are added to reduce Line conducted EMI. L1 and LX3 are added to reduce radiated EMI. The full BOM is shown in table 2 below. Transformer design: The transformer design specification is shown in Figure 5. The primary side formed by sandwich structure is used to reduce the leakage inductance of the transformer, improving the efficiency and the output current regulation. To improve radiation EMI, the maximum voltage swing which is on pin 3 of the transformer, should be at the most inner side. To meet the safety standard, Triple wire at the secondary side is normally adopted for providing insulation. 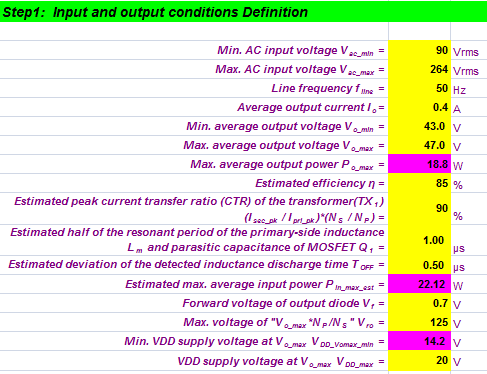 Table 3 below shows the LED driver input and output parameters over the full mains voltage range. As can be seen, the current line regulation is excellent. Driver efficiency meets the target easily, and Power Factor and THDi are fully in line with regulations for lighting applications. The PCB layout of the reference design is shown in Figure 6 below. It is build from double-sided FR-4 material and uses a narrow form-factor to make it suitable to fit into narrow T8 enclosures. To minimize EMI, current loops of the gate drive, snubber circuit, output diode and main MOSFET switching loop should be kept as small as possible. Ground of the IC, sense resistor, aux winding and Y-capacitor should all go to one central ground point on the input capacitor ground. Capacitors on the IC COMP pin, ZCD pin and MULT pin should be as close as possible to the IC. 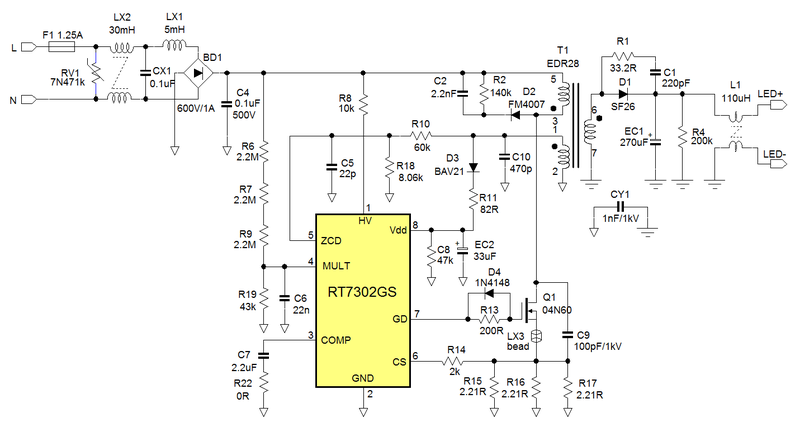 With the help of this step by step design guide and the RT7302 design tool, the user is able to quickly design a LED driver that fulfills the requirements for high performance offline LED drivers. The absence of secondary side sensing greatly simplifies the mechanical design, and allows small form-factor PCB design. When all guidelines are followed, the design should fulfill EMI and pass the surge tests. Although this reference design is for an 18W LED driver, RT7302 can be used in a wide range of LED driver designs, ranging from 8W ~ 60W.